Is Animation an Effective Tool for Data Visualization? The increasing use of animation (and 3D) in data and information visualization is definitely a trend, but I don’t think it’s a good one. My (possibly naïve) understanding is that motion in data visualization is great for engagement (nothing can capture the attention of the human visual system like motion), but can be a detriment to comprehension. Cognitive science researchers like Barbara Tversky and Richard Lowe discovered that animations—even “well designed” ones—were often less effective than static diagrams at communicating concepts like the inner workings of a British toilet (I’m not kidding) or the movements of a piano action. 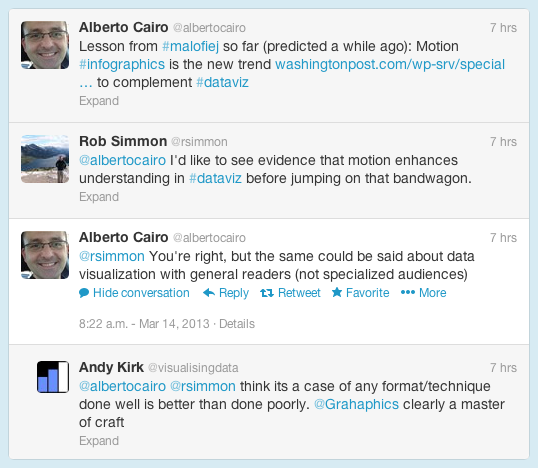 Motion may get more people to view a graphic, but they may learn less from it. But animation is typically more difficult and time consuming to produce than static visualization. Even if it’s no worse than a static graphic, is an animation worth the extra expense? Data visualization is a young field, however, and perhaps we’ll learn how to make beautiful, effective animations quickly & inexpensively. Right now, however, perhaps we should focus on improving more pedestrian information displays.